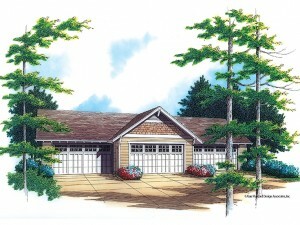 The Garage Plan Shop Blog » What are Garage Workshop Plans? What are Garage Workshop Plans? Garage workshop plans are commonly designed as detached garage plans incorporating one or more garage bays for parking or storage and a separate workshop area. The workshop area can be on the first or second level and is perfect for those who enjoy woodworking, crafts and other hobbies such as gardening. In some cases the workshop is ideal for a mechanic’s tools and auto parts. Many garage plans with workshops incorporate a workbench, cabinets, built-in closets or counters delivering plenty of workspace or room for storage of tools and supplies. Sometimes there is more than enough room in the shop area for a planting bench, gardening table or a complete setup for a home-based business. In other cases, workshop garage plans offer special extras like a utility sink, full bath or half bath. These convenient extras make it easy to clean up after a dirty job or a long day’s work in the yard. Workshop garage plans are practical and functional. With careful design, these floor plans are flexible allowing you to convert them from one thing to another as your lifestyle changes over time. What might be a woodworking shop at the present time might one day become a place to paint crafts or a storage space for those who can no longer climb the stairs to the attic or basement. Garage plans with workshops are available in a wide range of sizes and styles from Craftsman and barn-style to traditional allowing you to find just the right one to complement your home and fit your lot. Floor plans deliver various combinations of overhead doors and shallow or deep bays which accommodate everything from cars and boats to other types of motorized vehicles and equipment. Browse these garage workshop plans to find one to satisfy your needs.